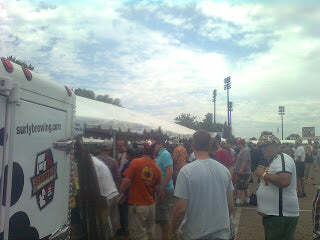 A mere hour into Saint Paul's Summer Beer Fest & I'm lost among pale ales of Extra, Imperial & lesser grades. The Midwest's ale scene in 2010 continues to pour copper colours of beer infused with green knowledge. Get out of the sun & into a shady Lyndale Ave. pub for a pitcher of bitter elixir, every drinker is on your side! And now that it's finally warm, a sky brimming with burning rays, let the understated goodness of mild permeate our fascination! What is Mild Ale? Why do I covet? How could I pass double, imperial, and umpteen more variations on Pale Ale? Examining history leaves one with fleeting footnotes to the opulence of what little malt flavor three decades of small malt flavor pours over foamy glasses called Mild Ale. Few styles run the gambit between red & brown hues, but Mild traverses both. A refreshing brown? It can be true! Like NB's kit, Mild often imitates a Scottish take on Rocky Mountain browns, or a drier glimpse at Northern English browns. In my best taste-visions, Mild takes a thinly malty glimpse at dark beer for a subtly layered ride! Complex bready or roasty malt profiles are the stars of the many British examples of award-winning Milds that proliferate the continental circuit. Banks! Brain's! Cain's! Rudgate's Ruby! Tetley's & Tim Taylor's! It's safe to say that without the expansion of British homebrewing in the 1960's & Campaign for Real Ale (CAMRA) throughout the late 20th century, we may very well be brewing examples of Mild Ales written from dead style notes, rather than oft-sustaining examples. I don't intend to be mean, history just seems to orphan the Mild Ale between populations of ale drinkers. At its pale point, Mild is just within red. Light examples brim with biscuity, slightly roasty tones inside a seemingly watery red beer. Most Milds would rather straddle the line of dark red towards straight brown; laden with subtle chocolate malt sweetness & dark bready roast tinges. Not unlike Light Scottish Ales, the English Mild plays on a small field. If one draws up a recipe that's too malty, then you're pushing brown. Go too hoppy & you've made a Common Bitter or a Southern English Brown. If it seems complicated... Well... Um... It's not? Mild was originally the term applied to any 'small' runnings of a larger batch of colloquial British beer. 'Stale' would be the term applied to the first, and perhaps second runnings; the Mild's parent drippings coming third, perhaps fourth - depending on OG. Mild found its place as the drink above table beer and below the standard Bitter. As economical as it would seem to make do with all possible runnings, though, Mild was more severely taxed than strong beers in 1800's Britain, leading to its subversion as a 'popular' style. Layer on decades of war, followed by corporate fizzyness through the last 50 years & we've found our beloved CAMRA movement, along with the ingenuity of micro & homebrewers, to be the enduring faces of Mild. Quite simply put then, as it would likely be today: pale drinkers wanted something hoppier, Brown Ale drinkers wanted something maltier. So why would you, dear drinker desire a Mild? For example, my fiance will call upon a Big Sky Moose Drool at any time of the year. I, rather, desire some light malt refreshment within my deep quaffability; thus, where mild enters. Light examples find crisp, snappy bread tastes from Biscuit, Amber, or Brown malts. They finish just a bit sweet. But the standard brown versions have that finely roasty edge permeating a yeoman's nutty malt profile. It's the kind of setting a dry British malt & dark crystal accent can best produce. Base malt should exceed 86% of the bill. Extract friends: Munton's malt extract is where it's at. 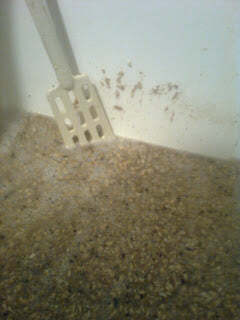 Stick to no more than 10% of British Dark Crystal malt in the grist. Now, here's the trick for style preference: Fill out the remaining 6% with biscuit or brown malt for a red take on Mild; 3% biscuit & 3% roasted barley for brown to downright black versions. Stay slight & noble with the hops. Kent Goldings & Fuggle are favorites. You might even boil as briefly as 30 minutes with certain calculations. 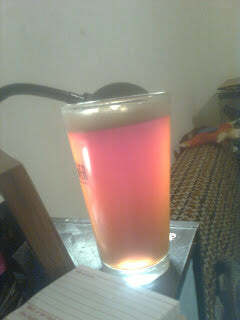 Stay with more neutral London Ale yeasts. Wyeast 1318 is gospel. Don't stretch your yeast budget, either! One smack pack or a 350 mL starter are plenty if you utilize yeast nutrients. Give it two weeks to ferment & taste the results. 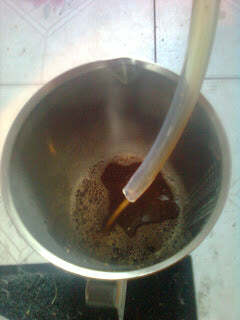 My efficiency called for more malt, Special Roast still wins my heart in London styles... It's Summer in these parts! Drink a beer that calls for another! 0.8 oz. Kent Goldings @ 60"
Ferment for two weeks, bottle/keg & enjoy.